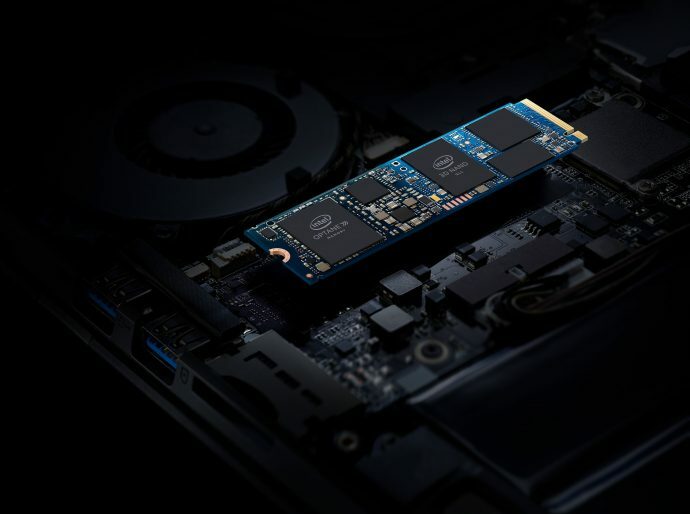 Intel in April 2019 introduced Intel Optane memory H10 with solid-state storage. The device combines the responsiveness of Intel Optane technology with the storage capacity of Intel Quad Level Cell (QLC) 3D NAND technology in an M.2 form factor. Credit: Intel Corporation.10 Apr 2019 Santa Clara - Intel has revealed details about Intel Optane memory H10 with solid-state storage - an innovative device that combines the superior responsiveness of Intel Optane technology with the storage capacity of Intel Quad Level Cell (QLC) 3D NAND technology in a single space-saver M.2 form factor. "Intel Optane memory H10 with solid-state storage features the unique combination of Intel Optane technology and Intel QLC 3D NAND - exemplifying our disruptive approach to memory and storage that unleashes the full power of Intel-connected platforms in a way no else can provide", stated Rob Crooke, Intel senior vice president and general manager of the Non-Volatile Memory Solutions Group. Combining Intel Optane technology with Intel QLC 3D NAND technology on a single M.2 module enables Intel Optane memory expansion into thin and light notebooks and certain space-constrained desktop form factors - such as all-in-one PCs and mini PCs. The new product also offers a higher level of performance not met by traditional Triple Level Cell (TLC) 3D NAND SSDs today and eliminates the need for a secondary storage device. Intel's leadership in computing infrastructure and design allows the company to utilize the value of the platform in its entirety - software, chipset, processor, memory and storage - and deliver that value to the customer. The combination of high-speed acceleration and large SSD storage capacity on a single drive will benefit everyday computer users, whether they use their systems to create, game or work. Compared to a standalone TLC 3D NAND SSD system, Intel Optane memory H10 with solid-state storage enables both faster access to frequently used applications and files and better responsiveness with background activity. SSDs with Intel Optane memory are the fastest compared to NAND SSDs in the majority of common client use cases. Intel-based platforms with Intel Optane memory adapt to everyday computing activities to optimize the performance for the users most common tasks and frequently used applications. With offerings of up to 1TB of total storage, Intel Optane memory H10 with solid state storage will have the capacity users need for their apps and files today - and well into the future. In addition to the first systems being made available through OEMs, including Dell, HP, ASUS, Acer and others, it will also be available on-shelf at Best Buy and Costco.